I realized the other day that due to a shortage of boring classes and sermons that my regular sketching has been somewhat nonexistent. So in an effort to remedy that I have decided that during the month of March I will try and do a sketch of a reasonable quality every day. I will be posting them on my blog in an effort for it to live up to its namesake. 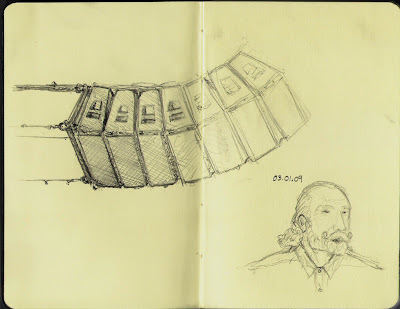 Todays sketch is of the speakers hanging over my head at church and of our pastor, Liam, as he is giving his sermon.